When asked about Google Map Maker, 32-year-old physician Leonel John Foronda compares Google’s online map creation platform to the Human Genome Project, a scientific milestone completed early in the 21st century. “This project started out with the aim of ‘mapping’ the entire human DNA,” says Leonel. He then explains that, similar to the Human Genome project, which took years to complete, Google’s vision of plotting an online, searchable map of huge portions of the world is a daunting task. But such a goal is achievable with local people like him who are interested and willing to help. Below, check out the timelapse video of how the map of Laoag City, Philippines has changed from just one year ago. Leonel discovered Map Maker in October 2008. “I was already a Google Earth user at the time. Although it was somewhat cool to play around with Earth, it was also disheartening to see major roads in Manila that were coarse and did not really align with the satellite map,” recounts Leonel. Around that time, he was surprised to see a detailed map of Manila credited to "Google Map Maker" embedded on a website. He immediately went to mapmaker.google.com and started making his own edits. His first edit was to draw a road called J.P. Rizal Street in his hometown of Laoag City, whose map had been completely blank except for the main highway. After only a few weeks, Leonel was hooked. Due to his unpredictable working hours at the hospital, he tries to squeeze in his map-making where time permits, provided he has his laptop as well as a decent Internet connection. At present, Leonel has 17,000+ edits in Map Maker, making him the top contributor in the Philippines. After spending hours mapping every square meter of Laoag City, he meticulously edited the boundaries and features of nearby provinces such as Cagayan, Ilocos Sur, Apayao, and other regions of the Philippines. “Since it’s all voluntary, my contributions are published on Google Maps and Map Maker for free. Although we receive no compensation, I personally would like to think of it as my own little way of helping Google’s mission to map the world.” However, he admits that there are perks to being a "Google Map Maker Power User". 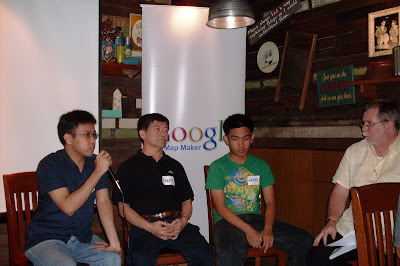 In April 2009, Leonel, with fellow map makers civil engineer Dante Varias and university student Wayne Dell Manuel, represented the Philippines in an international Google Map Maker User Conference in Bangalore, India. The three joined delegates from around the world to learn from each other’s experiences and hear from Googlers about updates to the product. Afterwards, the three shared their experiences from the event with more than 20 Map Maker users in the Philippines at a mapping party. “Personally, I feel honored that I am making something that could help people, businesses, and even tourism boards by placing them on the map. Anyone who has knowledge of a particular place, such as his or her own hometown, is encouraged to contribute to Map Maker. Becoming a mapper in this platform does not need high-level technical skills as there are experienced people who are ready to guide and moderate your edits,” says Leonel. With more and more people becoming map makers, he hopes that like the success of the Human Genome Project at mapping human DNA, the online map of the physical world will someday be complete.